Seinfeld fans can now have this perfect Del Boca Vista Phase II T-Shirt. We know that Jerry’s parents live in Florida and that Del Boca Vista is where they live and after having to move they ended up at phase 2 and this t-shirt is all about that. 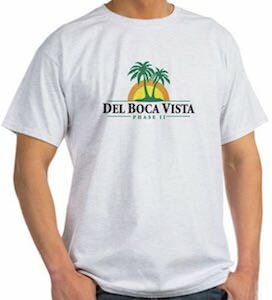 On this t-shirt, you can see a palm tree logo and below it the text “Del Boca Vista Phase II”. You can get this Seinfeld t-shirt in styles for men and women and they come in many colors and in sizes Small – 4XL. So show the world around you that you didn’t forget Seinfeld by wearing this t-shirt.